Bill Windsor volunteered for a polygraph examination to prove the truth in Montana. In fact, he volunteered for more than that. Bill Windsor told the Missoula Police Department and the Missoula County Prosecuting Attorney to hook him to a polygraph to see that he has never said anything but the truth. 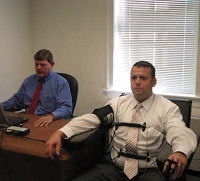 If I was the prosecuting attorney and my interest is justice, I'd jump all over an offer of a polygraph test. Bill Windsor's criminal complaint against Sean Boushie is now in the hands of the Missoula Police Department and the Missoula County Attorney's Office. So, the clock is ticking on whether they investigate. If they investigate, they'll have firmly established that Sean Boushie is a criminal. If they don't investigate, they will firmly establish that corruption is behind what is being done to me.